Home evil shero sergei plotnikov Team Russia Who the Hell is Sergei Plotnikov? Who the Hell is Sergei Plotnikov? With all the hype of the Kessel trade it's easy to forget about the signing of Sergei Plotnikov for a year and a manageable 925k cap hit. We all immediately penciled him in with Geno, and went back to analyzing Kessel's hot dog intake. Who is Plotnikov exactly, what kind of player is he, how many hot dogs does he eat during the season? Well, let's dig a little and see what we can find. He also footed the bill for his $500,000 KHL transfer fee to go to Pittsburgh. It's been said that Evgeni Malkin will help Plotnikov with the adjustment to the Yinzer culture and is fully supported by a Russian Support Group in Pittsburgh if needed. 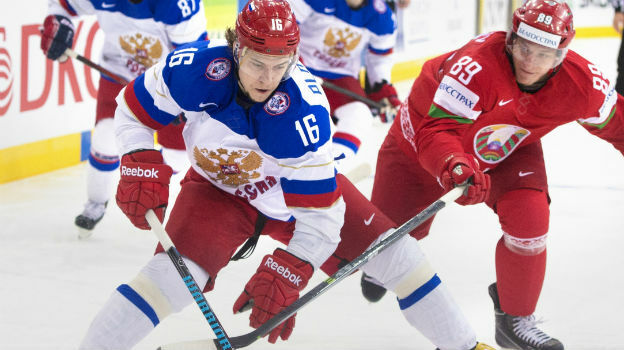 Plotnikov cut his teeth in the KHL (Russia's top professional hockey league) where he put up modest numbers at a young age. "A hard working winger with good game vision who plays an impressive physical game. He also has a good shot. Needs to improve his skating. - Anton Vasyatin, EP (2015) - See more at: http://www.eliteprospects.com/player.php?player=17760#sthash.jGQgEGue.dpuf"
Not bad huh? This was a team that included Ovechkin, Malkin, Kovalchuk, and Tarasenko together on the same squad. 1) What Plotnikov brings to the table is a valid threat on the wing with Malkin. He will play with snarl but not take himself out of the play to hit or chase guys to battle. He is a large power forward who works hard and is difficult to take off his feet. In the past, he has shown amazing chemistry with Malkin and Ovechkin respectively at the World Championships. 2) The character and drive he has shown in the small sample size interacting the media has really stuck out. Paying his $500,000 to go to the NHL is a prime example of a young man chasing his dream who is looking for an opportunity. 3) It's a low-risk signing. Having Plotnikov sign a 1 year entry level deal for the max 925k leaves the Penguins totally open to all options in the 2016-17 season. 4) There will be an adjustment period for Sergei and no amount of training can prepare him for the grind and speed of an NHL season. I can predict a conservative season with modest playing time on the second/third line where he will put up 30-35 points. I agree on all points, although what stands out to me is point 2. I love how excited he is to play here which makes me root for him more. He comes across as an average guy who suddenly got lucky enough to play with his favourite team and acts just like I know I would if given this opportunity. I am very excited to see where he goes this year with it. I think he's better than 30 points, so long as he's with Geno. He will get chances if he can get to the net.